Yellowstone Grizzly To Be Taken Off Endangered Species List After 42 Years : The Two-Way Citing a population rebound, the Interior Department has announced plans to strip the bear of federal protection. But some groups are skeptical, and they've signaled they're prepared to resist. A grizzly mother and her cub in Wyoming's Yellowstone National Park. For the first time in more than four decades, the Yellowstone grizzly bear is set to lose its federal protections under the Endangered Species Act. Citing a rebound in the bear's population, the U.S. Department of Interior announced its intention Thursday to end these protections and return oversight of the animal's status to the state level. The agency says the rule to remove the grizzly from the endangered species list will be published "in coming days" and "will take effect 30 days after publication." 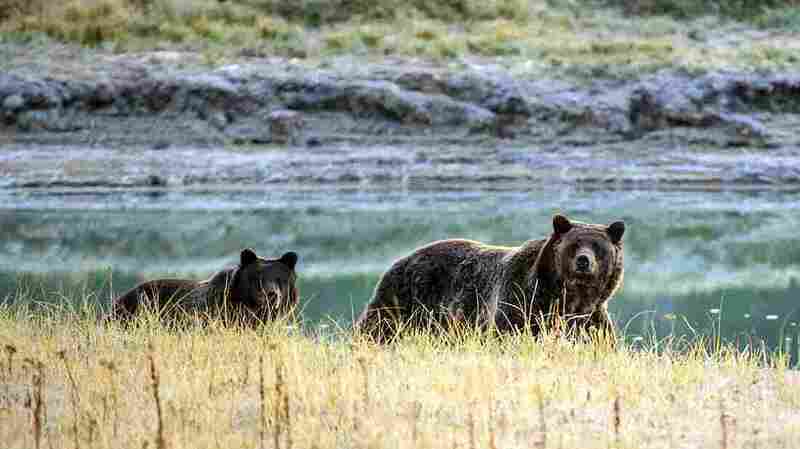 Since those federal protections were instituted in 1975, the Greater Yellowstone Ecosystem grizzly bear population has climbed from 136 to roughly 700, according to the National Park Service. The NPS says the bears — which generally roam in Wyoming, Montana and Idaho — "have gradually expanded their occupied habitat by more than 50%." Others are less enthusiastic than Zinke about the bear's future without federal protections. "Grizzly bears are the slowest reproducing mammal on the planet, and a population decline can take decades to reverse," Derek Goldman of the Endangered Species Coalition says in a statement emailed to NPR. "Therefore," he continued, "we have been calling on Fish and Wildlife Service and the states to develop adequate management plans for grizzly bears before any delisting is finalized. We will closely review the final rule to ensure there are adequate protections for grizzly bears." Against the population rebound over the past 42 years, the coalition also set another, grimmer set of numbers about grizzlies: "In the 1800's, approximately 50,000 grizzly bears roamed the lower 48 states. Today, fewer than 2,000 remain." Tim Preso, an attorney for the conservation group Earthjustice, suggested the organization might fight the move. "The government's campaign to remove protections provided by the Endangered Species Act overlooked important conservation issues and denied public comment on key points," Preso said. "We will closely examine this decision, and are prepared to defend the grizzly if necessary." This isn't the first time the fate of the Yellowstone grizzly has proved to be a point of significant contention. Last year, under the Obama administration, the U.S. Fish and Wildlife Service also proposed removing the bear from the endangered species list — using the roughly the same language Zinke adopted for his statement, in fact: "The restoration of the grizzly bear in Montana, Wyoming and Idaho during the last three decades stands as one of America's great conservation successes." And, as The New York Times notes, the Fish and Wildlife Service also attempted to strip the bear of federal protections in 2007 "but was ordered by federal court decisions to reconsider its analysis because of a decline in white bark pine, a key bear food source that has been decimated by insects partly because of warmer temperatures in the region."